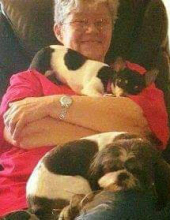 Mrs. Sherrie Powers Brown, age 70, of Rockmart, GA passed away Monday, April 8, 2019 in a Rome medical center. She was born in Rome, GA on October 18, 1948 a daughter of the late John Worth Powers and the late Elgerie Woods Powers. Sherrie had been a resident of Rockmart the greater part of her life and was a 1966 graduate of Rockmart High School. She was a member of the Lake View Baptist Church, enjoyed music, traveling and loved her dog "Boo":. Sherrie also enjoyed watching the Georgia Bulldogs play football. She was an LPN having worked at Rockmart Nursing & Rehab. In addition to her parents she was preceded in death by her husband, Howell (Hal) Brown; daughter, Tiffany Hammonds and by a brother, John Powers. Survivors include two grandsons: Kain Hammonds and wife Marisa Hammonds, Rockmart and Brandon Hammonds, Rome; two great grandchildren: Mercy and Nate Hammonds, Rockmart; son in law, Brad Hammonds, Rockmart. Memorial services will be held Sunday, April 14, 2019 at 4:00 pm in the chapel of the Alvis Miller & Son Funeral Home with Rev. Eddy Hughes, Rev. Brent Edwards and Rev. Jeff Carlton officiating. The Alvis Miller & Son Funeral Home & Crematory is in charge of arrangements for the memorial service of Mrs. Sherrie Powers Brown. To send flowers or a remembrance gift to the family of Sherrie Powers Brown, please visit our Tribute Store. "Email Address" would like to share the life celebration of Sherrie Powers Brown. Click on the "link" to go to share a favorite memory or leave a condolence message for the family.